Israeli military and government officials have blamed the Iranian axis for incitement by allowing Syrian Arabs to cross into the Golan Sunday. At least two people were killed -- an Israel citizen and a Syrian, who was killed on the Syrian side of the border. Estimates of those who crossed the border ranged from hundreds to 2,000 or more. Some of them said their intentions were to reach Yafo (Jaffa) as part of the Nakba Day protests against the re-establishment of Israel as a Jewish state on May 15, 1948. 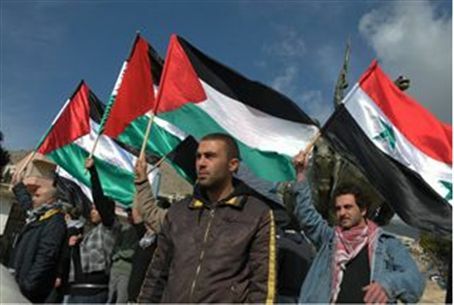 The infiltrators staged an unprecedented rally, waving Palestine Liberation Organization (PLO) flags in the town of Majdal Shams, located near the border and on the road to the Hermon Mountain range. The IDF explained it restrained from using force that might exacerbate the situation but had “opened fire in order to prevent the violent rioters from illegally infiltrating Israeli territory. “A number of rioters have infiltrated and are violently rioting in the village. From initial reports, there are dozens of injured that are receiving medical care in a nearby hospital,” said the IDF. Israeli citizens in Majdal Shams told Voice of Israel government radio that they do not want the Syrians in their town but also would not allow the IDF to evacuate them. Officials from the International Committee of the Red Cross (ICRC) reportedly will try to evacuate them on condition that Israelis are not involved. An IDF spokesperson said that Syria rules its side of the border with an “iron hand” and easily can prevent anyone from crossing into Israel. He said that Syrian President Bashar Assad is trying to cause a disturbance, and government officials said Assad wants to draw attention away from the brutal suppression of the rebellion that has resulted in the murders of approximately 850 protesters.